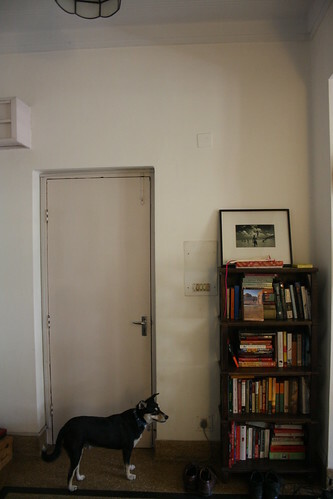 The darling of Jor Bagh. Though living in an upscale neighbourhood that is home to authors, publishers, artists and foreign correspondents, Kaloo knows no class divide. He has bitten his owner as well as the grocer’s deliveryman. 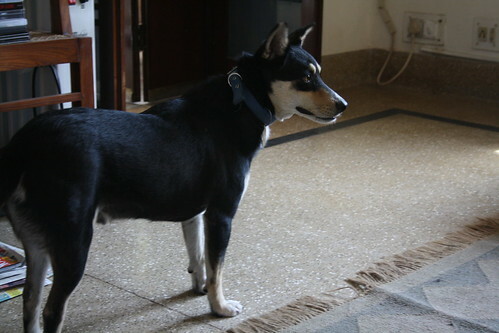 Patting his head, the owner describes Kaloo (“black” in Hindi) as “part German Shepherd, part Jack Russell Terrier, part wolf.” Sitting on her white sofa, she calls out to Kaloo, saying, “Engage, engage, engage with me.” Wagging his tail, he looks up at his mistress before being distracted by The Delhi Walla, at whom he growls with suspicion. Kaloo’s new master then enters the living room. “Kaloo has come a long way since he nipped me on my left ankle,” he says. The dog wags his tongue, as if in agreement. 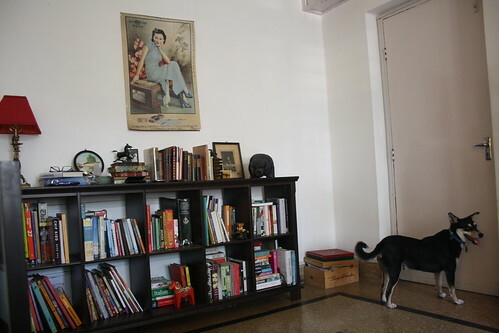 Kaloo has lived in Jor Bagh longer than his new owners. 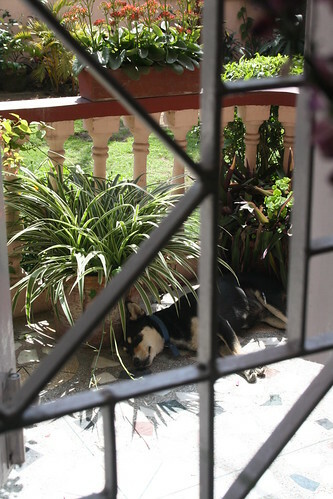 He roamed the streets, barked at the residents and slept under the cars parked outside the bungalows. Infamous for being a biter, many people were scared to walk in front of him. 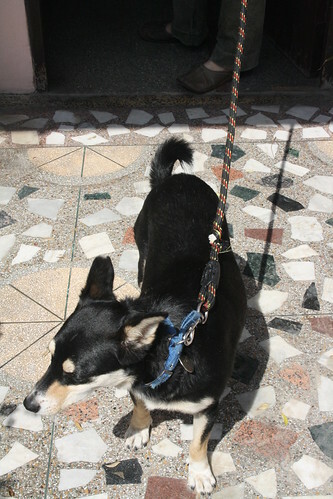 However, Kaloo also succeeded in establishing friendships; to the colony’s chowkidars, he is a darling. Then the courting started in earnest. The woman won Kaloo with two pieces of chicken. 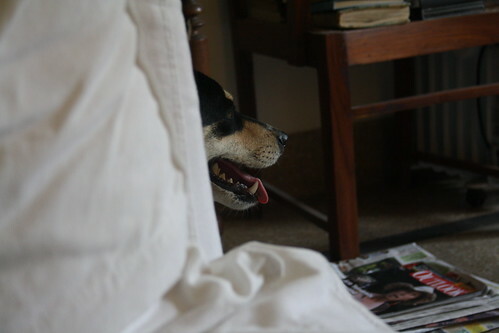 He stopped barking and snapping at her and became a visitor to her house. She arranged for a vet to give him the shots. By looking at Kaloo’s teeth, the vet estimated his age to be six years old. 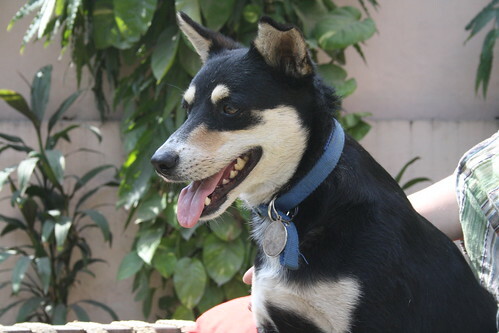 Next, his new father got Kaloo a dog license at Motibagh NDMC Vetinary Clinic. It hangs around Kaloo’s neck like a medal so that municipal services do not mistake him for a stray and whisk him away. what a fine and handsome dog! and kaloo is such a darling name. i am quite fed up listening to english names all around. I'm sorry to note that the delhi walla chose to waste his precious blog on a dog when this city has so many real people with real problems. 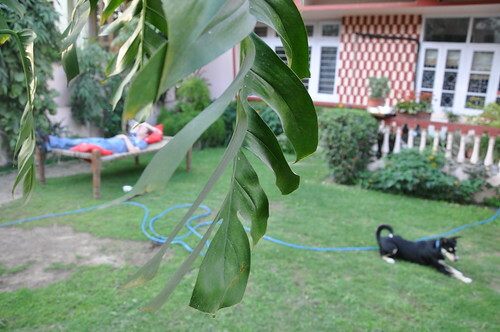 Dear Anonymous, the Delhi Walla doesn't just have to write about problems. He can also write about things that are life-affirming. If you want to highlight the many problems you see around you, then you should; there's plenty of space for everyone on the internet. i'm sorry to note that anonymous chose to waste my precious time when i have much better things to do like taking care of dogs. 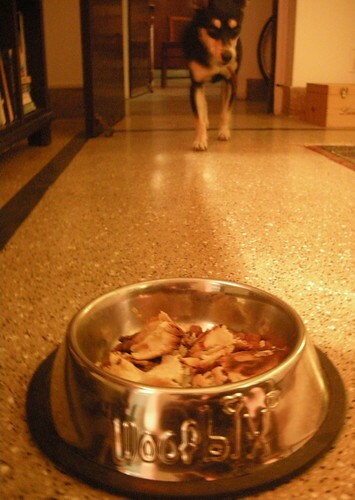 ditto about the english names….and kaloo is handsome! Gorgeous face!Such an interesting story. Kind-hearted owners. so delhiwalla,did he snap or bite you?